Melanocytic tumors are some of the most difficult neoplasms dealt with in the world of diagnostic pathology. While most melanocytic lesions are not diagnostically challenging, a significant minority show histopathological features that are ambiguous, making it difficult to assess their invasive and metastatic potential. Overdiagnosis of a benign nevus may cause significant morbidity; scarring following a wide excision in a cosmetically sensitive location such as the face, lymphedema secondary to lymph node dissection, and/or the adverse psychological impact of an erroneous malignant diagnosis. Underdiagnosis of a melanoma may provide the time during which a potentially curable malignancy advances to an untreatable illness. 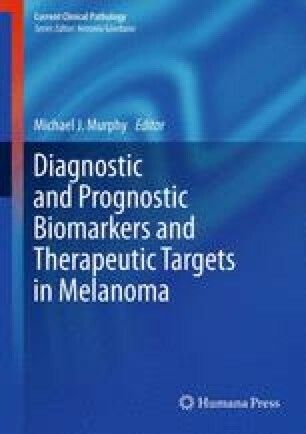 This chapter discusses the evaluation of protein markers by immunohistochemistry, as an aid in the diagnosis of melanoma.